Okay, now that we have that out of the way. The wind has stopped, and the sun is (mostly) out, although there is a bit of fog over the harbor. 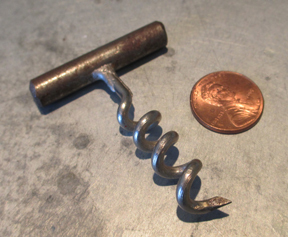 On to corkscrews… The other day, I found a nice little Williamson Bottle Roundlet online, and after a bit of negotiations, the price came down to something quite reasonable. 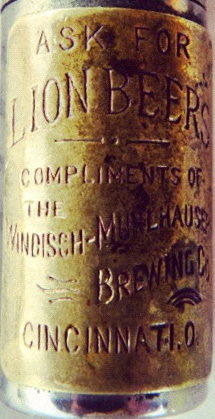 This one is nice as it is an advertisement for Lion Beers. A nice addition to the collection, although this might be added to TWJ’s pile for trade. 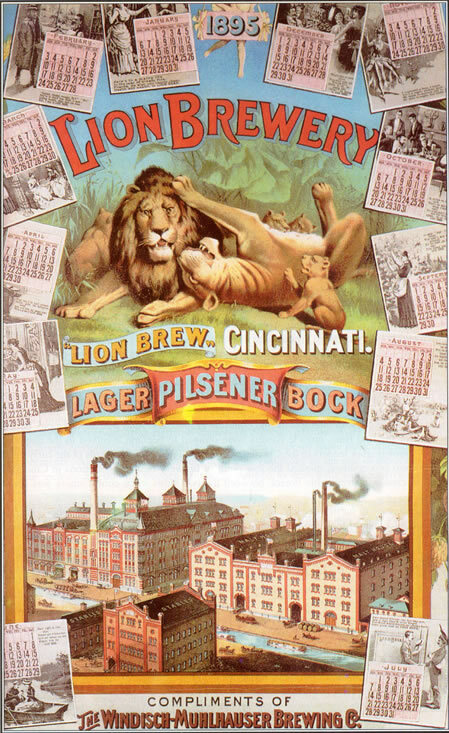 I am sure he already has this, but this looks to be a nice Cincinnati brewery corkscrew. Also, for those that are wondering, to this point the hurricane hasn’t really hit us. We have had some rain, some serious wind, and the ferry has cancelled service to the mainland for the past 2 days, but other than that we are okay. Of course, it could get worse as the day progresses, but so far…we are dry, safe, and have power. 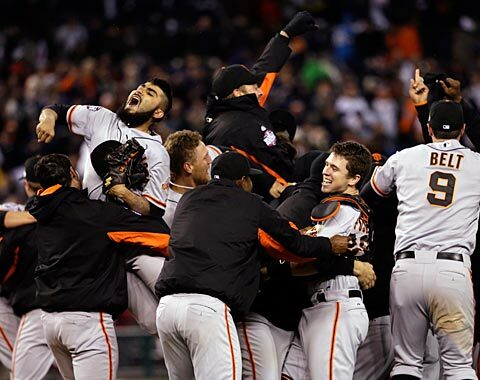 Let the countdown to spring training begin!!!!! After a few days in Boston, the lovely bride and I are heading towards home this morning. A few days will be spent in a small cottage midway between here and home, and then Saturday we will head back to the island. While we have been gone, a contractor has been removing all the walls, ceiling, and various other parts of–what will be–our master bedroom and bathroom. So, upon our return it will be time to design, rebuild, frame in, and finish the master. Hopefully by the end of November/Early December we can move from the guest room into the finished master. Of course, after that is complete, and weather permitting, we will dormer out the office, take down a wall, and expand the guest room so that too will have a view of the harbor. It really depends on how much snow we get this year, or how early we get snow this year. 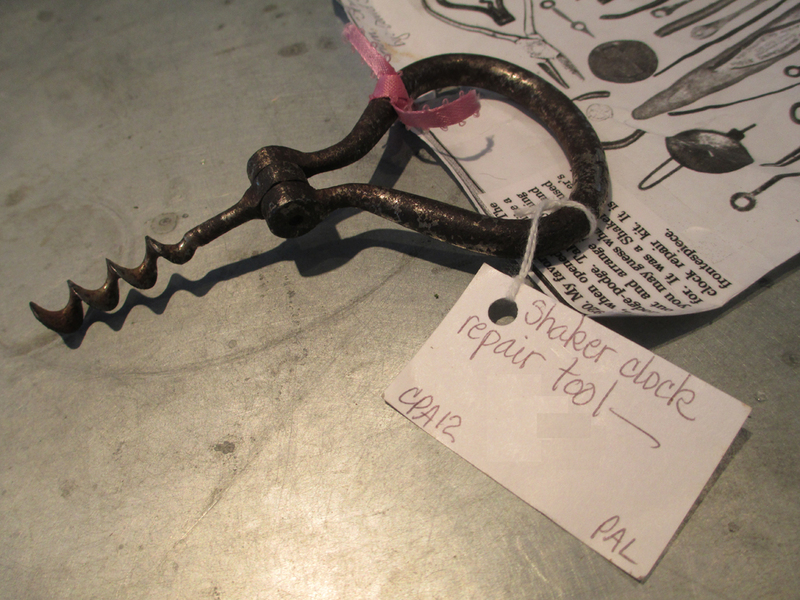 A couple of years ago, I found a tool kit that came in a tin box, and the tool itself read “PATS APPLD FOR.” I emailed Bob Roger at the time, and he said he and DB both have one, but no one had ever come up with where the tool kit with corkscrew came from. Neither had the box, but I had hoped the distressed logo might give a clue. After further research, there were still no answers. As it happened, yesterday, I managed to find another one. And, this time there is information, as the logo on the tin box was mostly in tact, and you can see who manufactured it!!! So, after a little surfing around, I found an advertisement for the very same tool in an old Chilton catalog–which dates the tool to 1915! 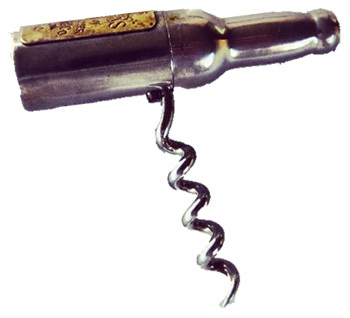 Now, the question is did the American Novelty Company of Washington DC ever receive a patent for this particular corkscrew combination tool. With multiple patents applied for, surely one must have received a patent. Going away for a week, can make for an interesting trip to the post office upon your return. A myriad of packages were awaiting my visit to the p.o. 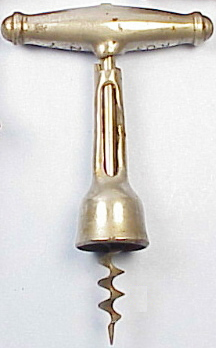 box, and not only that, but also a copy of Bob Nugent’s article on Thomas Curley Corkscrews were amongst the magazines, political ads, bills, and catalogs that is the usual mailbox filler. Thanks Bert for a copy of the article! (Don, a copy will be sent to you next week!). There were many corkscrews that were amongst the packages. 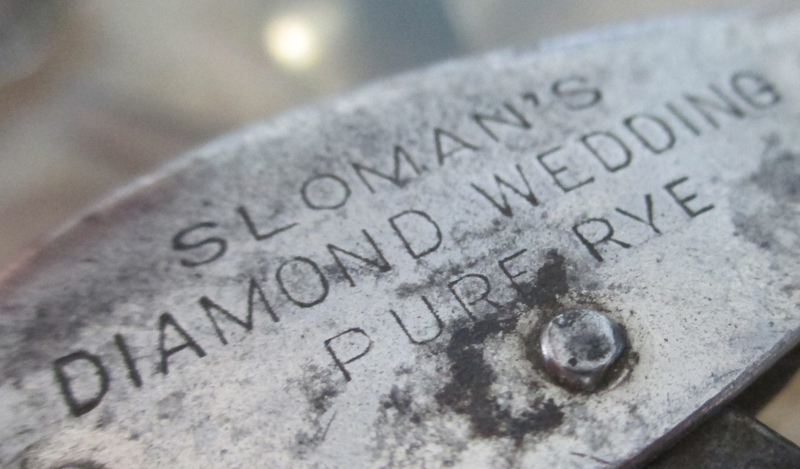 A couple of Williamson Flashes (for Tommy), a Detroit leg with advertising for Sloman’s Diamond Wedding Pure Rye, a fantastic Curley, the Jopson that was sent for my inspection–amazing that for 13 years I can’t find a single Jopson, let alone even have the chance at buying one, and now there are two sitting in the corkscrew case–a McLean patent, Coney embossed shank Henshall, Arnof patent, small Turkey foot folding corkscrew, and a couple of others. And, it looks quite nice next to the other Curleys in the collection. Of course the McLean is pretty cool as well. 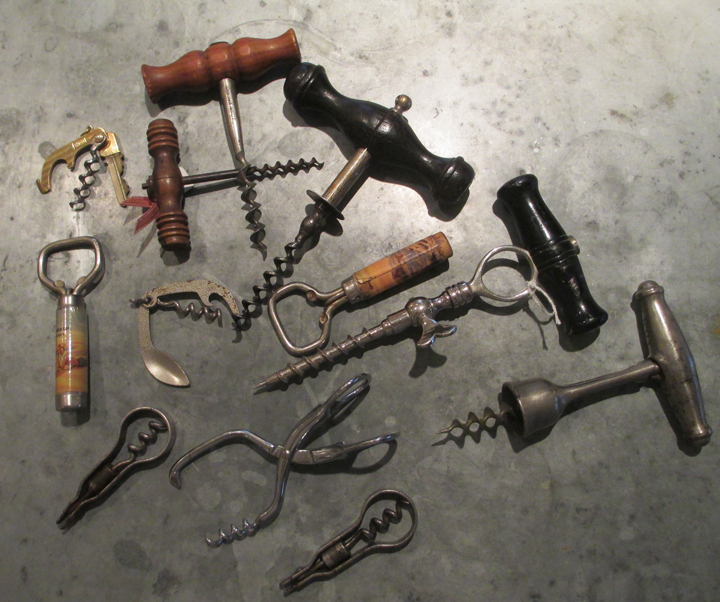 Definitely some nice corkscrews, some of which will be staying in the collection, and some–as they are duplicates–will be listed on the upcoming ICCAuction. On a non-corkscrew note, the lovely bride and are I headed to Boston for the next several days, so the blog may not be updated regularly. However, I will provide news upon our return. 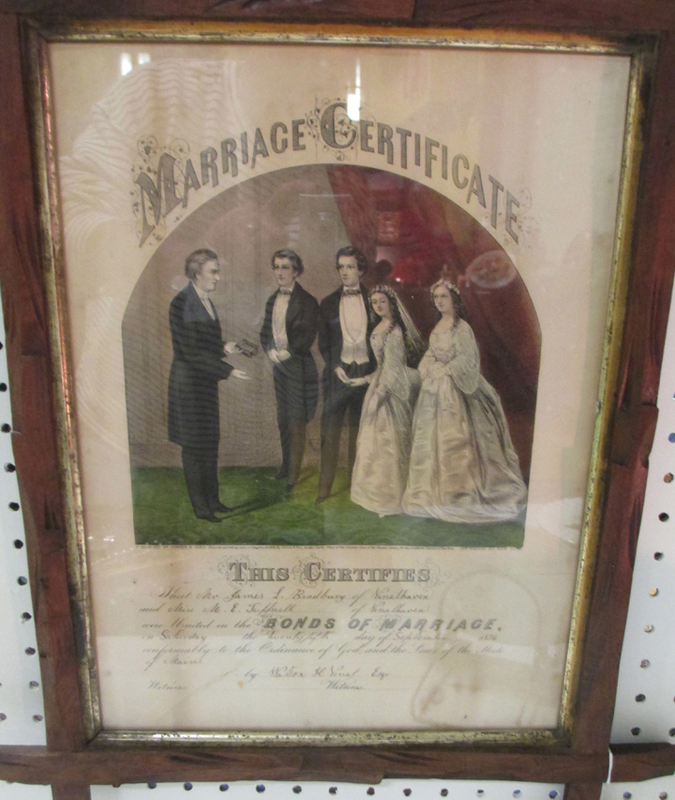 There were, however, a few antiquing adventures and some wonderful times spent with the lovely bride and a few friends. There were a couple of corkscrews found. This was followed by trip to “Cork,” the wine bar that sits across the street. While we did manage to pick up three corkscrews that first day of antiquing, and a couple of others the following day, it was yesterday on our way back from Vermont that I had a feeling that something interesting would be found. After hitting several shops/malls on our way from VT to MA—where we are staying for a couple of days–no corkscrews of note were to be found. 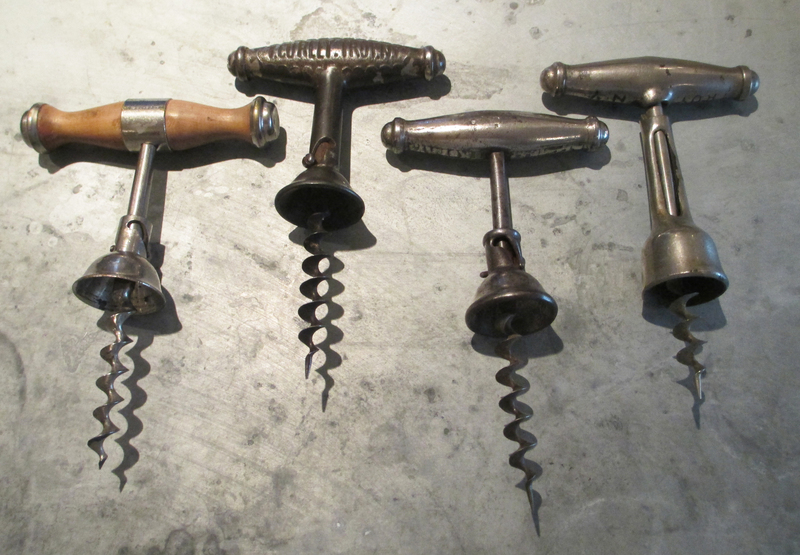 And, in one particular shop, I opened 13 Fray patent multi-tool handles (and one’s similar to the Fray) hoping that a corkscrew would be hiding in the wooden handle. So, we started along our way, and noticing the time, realized that stopping for leisurely hunting in antique shops was going to have to wait until the next trip. However, after traveling a couple of hours, we turned a corner and I saw an antique mall, and we agreed that we had enough time to make a quick stop. I headed in, and within the first booth found 5 corkscrews. All simple Cloughs, and one wooden T with a price tag of 35 bucks. If that was going to be the price on a common corkscrew, things were not looking promising. After a few more booths, I saw some can openers, a Williamson, and another simple T. Then, in a coffee cup sitting on a shelf, I saw what looked like the handle of a can opener. No corkscrew was visible, just the handle. I reached for it, expecting it to be some random opener. Instead of a common can opener, I pulled out a corkscrew that caused my heart to skip a beat. While I recognized the corkscrew, and have one being sent to me for my inspection and potential purchase, I couldn’t believe it was here, in my hands, with a price tag of 15 dollars. Holding it firmly in my grasp, I continued to hunt for others. Although, the excitement of finding this particular corkscrew probably clouded my ability to ferret out others. Note to self, go back to this shop!!! Finding no other corkscrews (worth buying) in the rest of the shop, I headed to the register, plunked down a 20 and waited for the change. The lovely personal trainer and I are heading to Vermont for a few days. 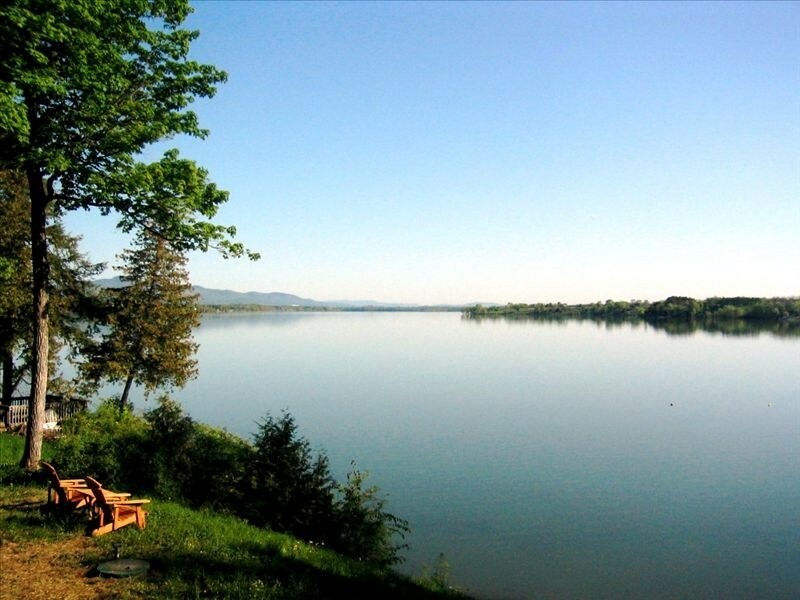 So, we will (mostly) be offline; a little rest, relaxation, wine, fishing, antiquing, and exploring the area, and enjoying the fall colors. If any corkscrews turn up during the trip (or any noteworthy fish are caught) I will report back here (when we return back here). That said, for those of you wondering how you will fill your days without a picture of a new find, acquisition, or report from ebay, I did manage to procure another American patent corkscrew yesterday. Well, actually, I didn’t procure it yesterday. It was given to a mailman yesterday, and will soon be arriving on the island. 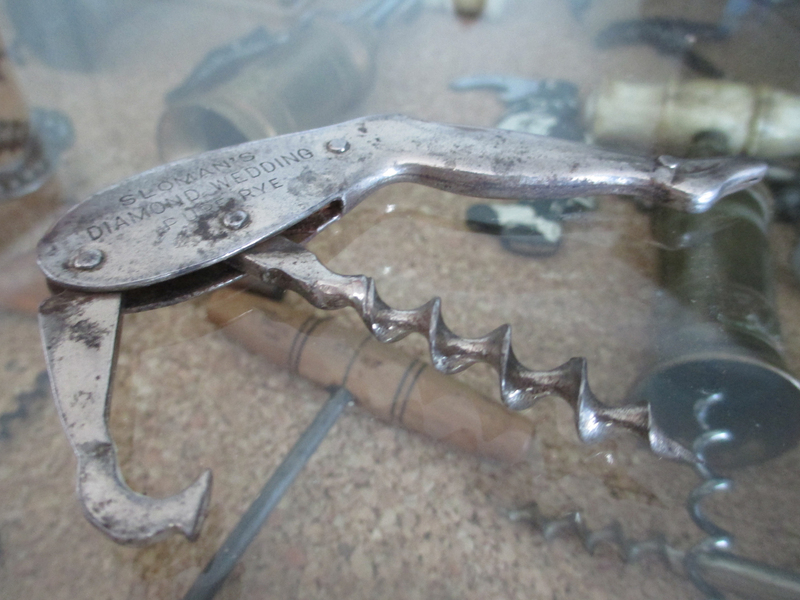 And, Mr. Jopson’s 1899 patented folding corkscrew will be awaiting our return. 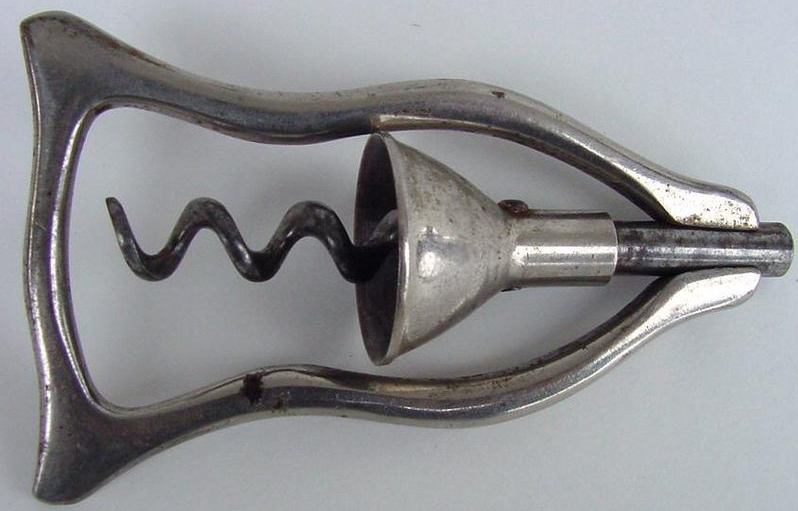 Last week, a 1933 American patent corkscrew was listed on our favorite online auction site. And, the auction ended moments ago. That said, auctionsniper did the job it was tasked to do, and the 1933 Arnof patent tongs/corkscrew will soon be heading to the island. And, before you ask, yes, this will probably end up with me building a webpage dedicated to the corkscrew makers of Troy, NY. I have had several variations of Thomas Curley’s patent over the years, and while there are still some variations that I would like to own, one in particular has proven to rather difficult to find (or buy for that matter). That said, whilst in Chicago, a nice American patent corkscrew was offered to me, and since we couldn’t strike a deal that final day, we agreed to revisit the potential deal in the coming weeks. 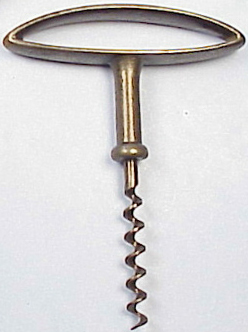 After an inquiry as to other corkscrews that might be available, a picture of the desirable Curley arrived in my email, and as of this morning the deal was done. 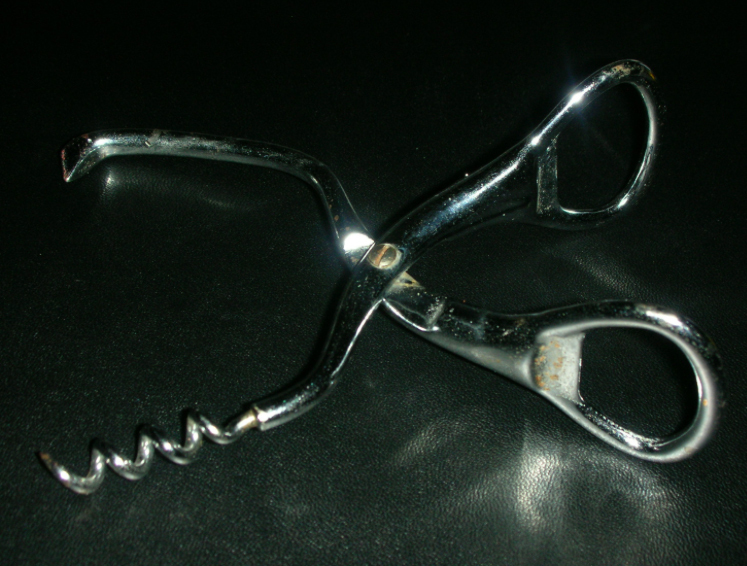 Now, there are a couple more corkscrews that are part of the deal; one thrown in as a gift with purchase, the other might be a double, but I won’t know until I can compare it to a similar looking corkscrew in the Frary corkscrew collection. 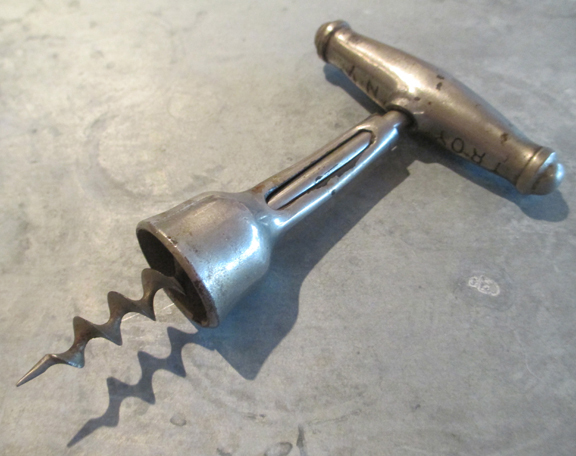 That said, if I am going to build a webpage dedicated to the corkscrew makers of Troy, NY, I really need a folding Hicks and Reynolds corkscrew. I missed out on one at the ICCA AGM in Chicago, and prior to that lost out on one on eBay. So, if any of you happen to have one, I will gladly trade for it. Drop me a line! I headed off on the first boat yesterday, and after hopping in the Mini, headed a few miles down the road to an antique show. 60 dealers, hopefully one or two would have a corkscrew. Or, perhaps one dealer would have several. After walking the through the booths, twice, I did run across a couple of corkscrews. One, I didn’t buy, as it is the same one he has been trucking around for at least 4 years, and I have seen it at the various antique shows around Maine (and in Brimfield) multiple times. The price remains the same ($ 225) and it is barely worth 1/4 of that. On my second round of looking, I did see a small corkscrew in a case. After asking the price, and hoping they might look for others, I forked over my three dollars, and continued my search. Around another corner, I made another interesting discovery. The corkscrew is just a simple bow, but the dealer had some rather interesting documentation to accompany the corkscrew. 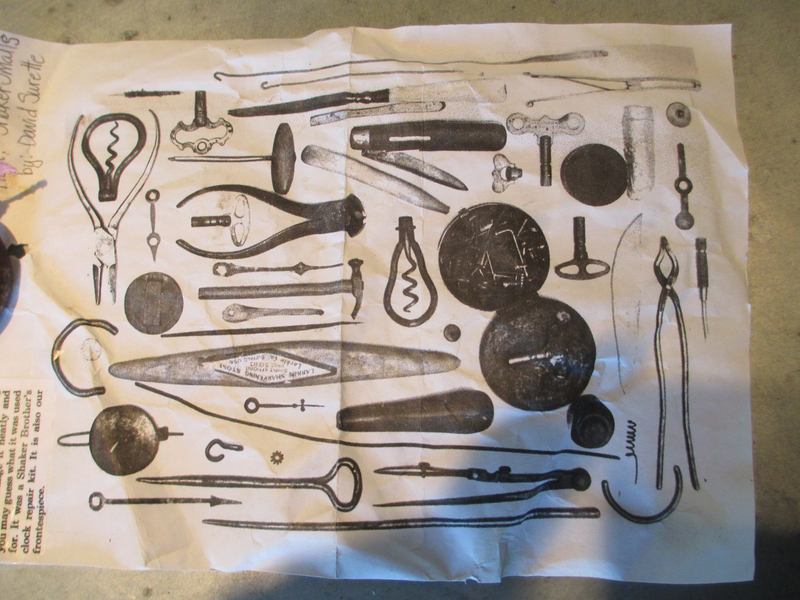 She had found an old copy of Shaker Smalls, and within that book had a copy of an image of “Shaker Brothers Clock Repair Kit.” And, within that image, there are two corkscrews shown. 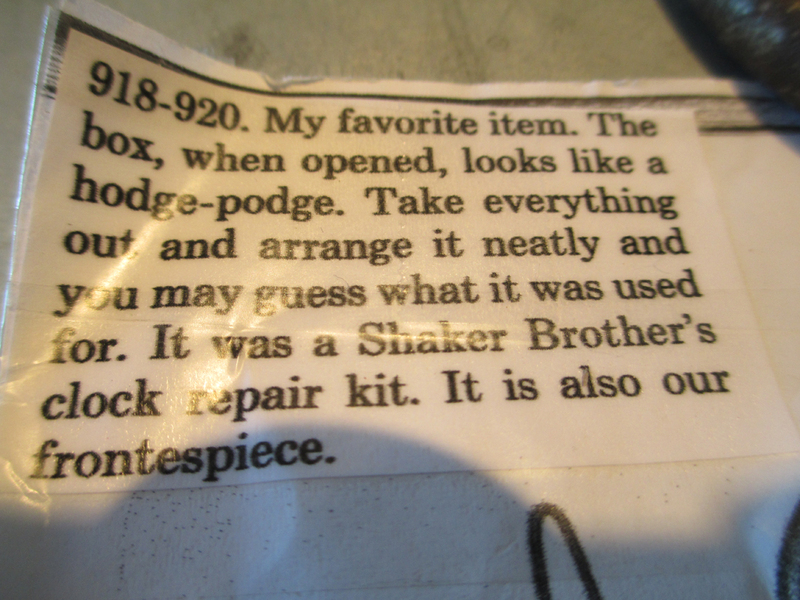 Advertised by the dealer as a “Shaker Clock Repair Tool,” I couldn’t pass it up (especially at a price of 12 bucks). So, while there wasn’t any real corkscrew finds at the show, I did make another purchase. 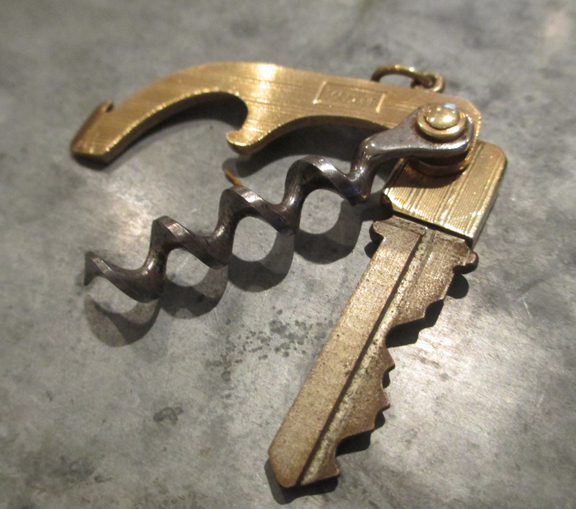 And, this is actually something I have wanted for the corkscrew collection for some time. 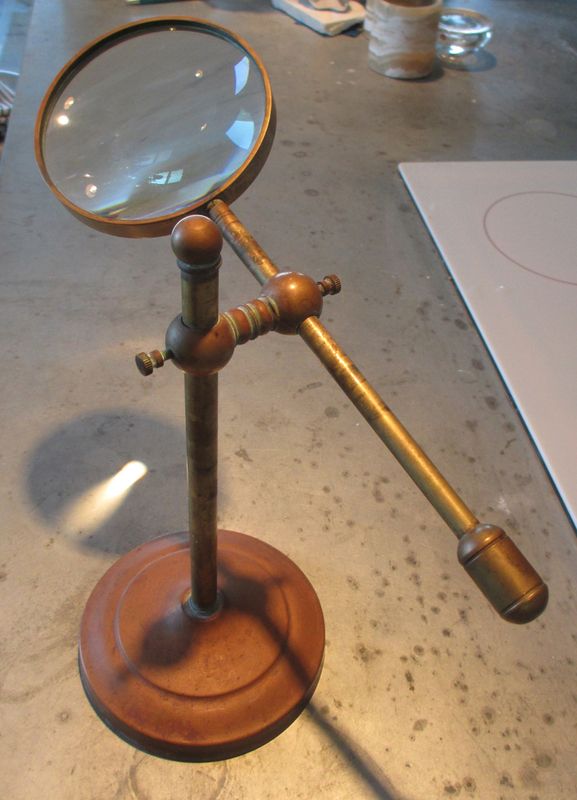 It is an antique desktop magnifying glass. 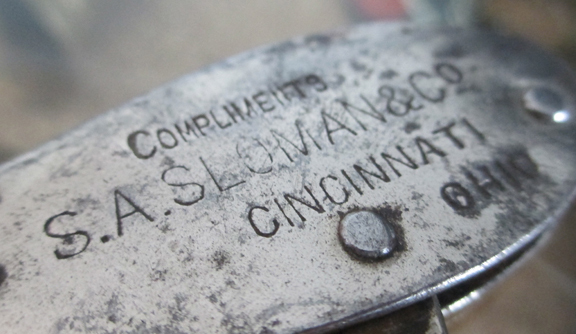 While I don’t mind using a loupe to examine markings on corkscrews, this makes it a little more user friendly for others. And, there is definitely less risk of stabbing yourself in the eye with a helix with this option. There was one more interesting item at the show, and this would be Vinalhaven related. I left this behind, but took the person’s number on the off chance that someone from the island was interested. 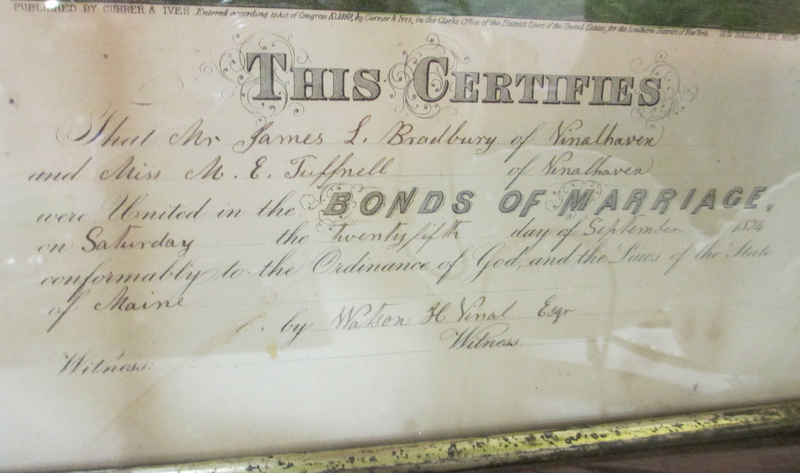 It is a marriage certificate from 1874 from Vinalhaven, and witnessed by Watson H. Vinal. You never know what will turn up at a local antique show!!! A rare corkscrew would have been an exciting thing to find, but not a bad morning on the mainland.